At HEROES, we love bringing people together! Let us help you with your next birthday party, team building event, or "just because" get together by hosting it with us! Make sure it's a day they remember by unlocking the door to amazing adventures you can share together. Our VR guides will help you create an engaging social experience that's the perfect fit for your group. Decide on your expected number of VR players, and select from the options below. Don't see what you're looking for? Fill out the contact form to be contacted by a professional VR party planner. In order to ensure you and your party have the best possible experience we ask that you book at least two weeks in advance, although if you get in touch we will always do our best to accommodate you. Perfect for smaller to mid-sized events or parties with 8-16 players. 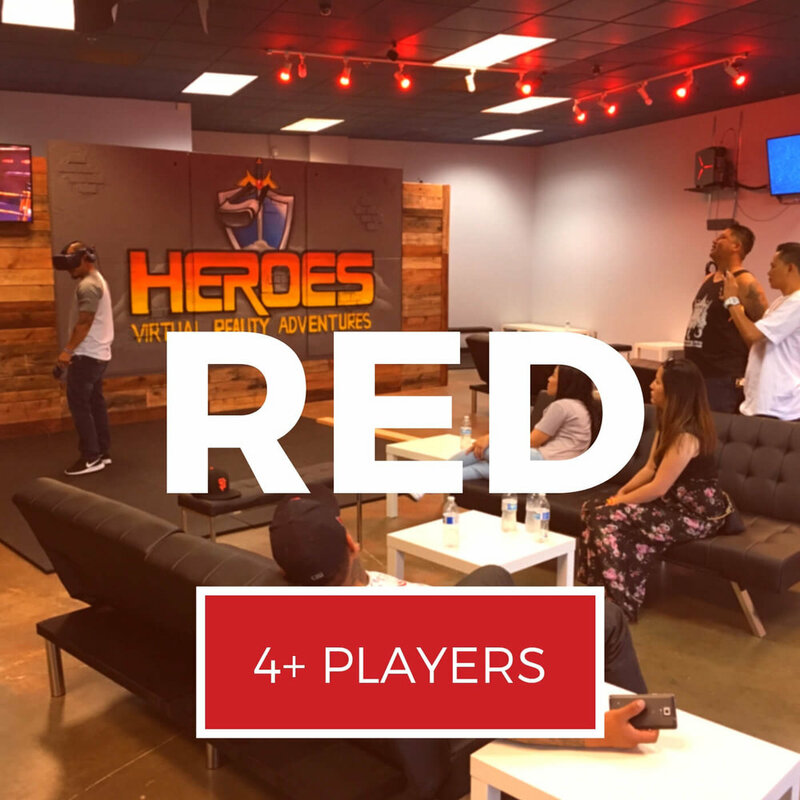 Enjoy our 4 "Red Team" VR bays - including our upgraded Vive Pro - for 2 full hours of play time (30-60 minutes per person), plus an additional 15 minutes before and after for setting up your group. Allows your guests to socialize in our group-friendly play space and enjoy several multiplayer or personal VR experiences. Our most popular package! Perfect for medium to large events or parties with 12-18 players. Enjoy our 6 "Blue Team" VR bays for 2 full hours of play time (40-60 minutes per person), plus an additional 15 minutes before and after for setting up your group. Allows your guests to mingle and socialize in our group-friendly play space while enjoying several multiplayer or personal VR experiences. The ultimate party! Perfect for extra large events or parties with 20-30 players. Enjoy all 10 of our room-scale VR bays - including our upgraded Vive Pro - for 2 full hours of play time (40-60 minutes per person), plus an additional 15 minutes before and after for setting up your group. This is a full facility rental. Your guests will be able to mingle and socialize freely in our group-friendly play space while enjoying several multiplayer and/or personal VR experiences. Can't find what you're looking for, or have additional questions? Fill out the form below to be contacted by one of our party planners. For events that bring us to you, or for even larger groups or rental periods, start here! Trying to book a party outside of our normal hours? Give us a call and we’ll do our best to accommodate you! Tell us briefly about your booking! Is this a birthday or corporate event? Age of birthday hero or name of company? Anything else we should know? For small group and short timeframe events, the sidekick party lets your guests get a quick taste of VR. Enjoy 6 VR bays for a single hour of play time (30-60 minutes per person), with an additional 15 minutes before and after for setting up your group. Payment of non-refundable deposit equal to 30% of total Party Package price required to make reservation. We will do our best to accommodate rescheduling where possible but cannot guarantee times other than the initial reservation.